The simplest of all vertical gardens is a half hanging basket, but there are now modular systems that work well, are easy and light to install, and which can be rearranged or extended to suit your needs. Most include a support or frame and a system of planting modules. 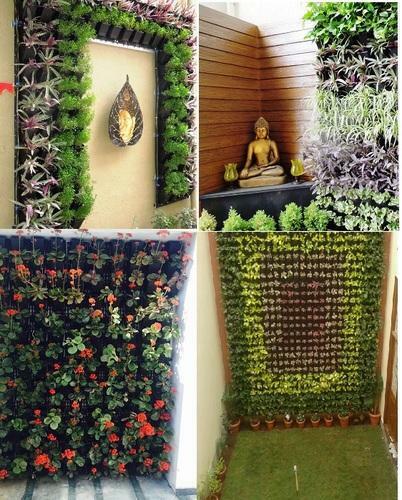 Here are tips on how to select a vertical garden system for your wall as well as information on some of the available systems. Backed by our industrial experience, we, 'Alfa Green', are established in the year of 2004, are an eminent organization engaged in manufacturing and Service Providing a wide range of Solar Products, Greenhouse Structures, Decorative and Solar Products and more. We also manufacturing, Exporter and Service Providing a wide range of Green Gardening Services, Poly House, Shade Net structures and Solar Tunnel Dryers, Bonsai Trees, Terrace Gardening and more. Our experts render these services to the clients as per their specific needs and requirements. Our products are highly appreciated in the market because of their unique design and unbeatable price. We carry out the entire production process under the watch of professionals who are the experts of this domain and aware of the prevailing norms of the industry. The entire production process is carried in a smooth manner, owing to the support of our sophisticated infrastructure. Supported by infrastructure and dexterous workforce, we are able to provide the offered products as per the specifications are given by patrons.